The road Vikings withstand a late Crimson Tide rally for their eleventh straight win. The Forest Grove girls basketball team is running hot. After losing their initial two games to Sheldon and South Medford, the Vikings had won 10 straight prior to their Tuesday, Jan. 8 game at Glencoe, and not even the Crimson Tide could wash their momentum away. 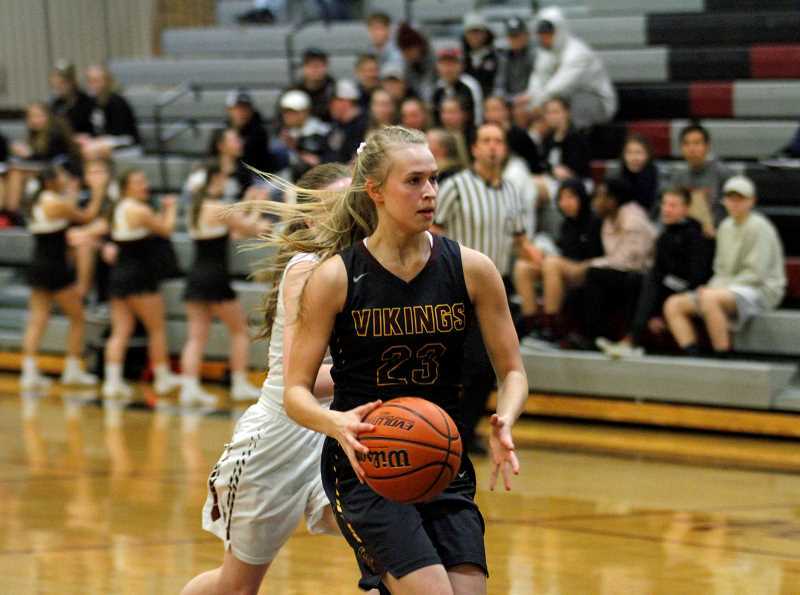 The Viks defeated the Tide 51-44, using a balanced attack, swarming defense, and grit developed over more than a month of hard-fought games against very different competition. "Every game we've had to battle through adversity," said Forest Grove head coach Dan Lumpkin. "We've had to battle against all different types of teams. Teams that are physical, teams that are fast, teams that can shoot, so we've had to learn different ways to respond when teams make runs, and we did that tonight." Forest Grove opened up a nine point lead at the half and grew it to as much as 11 in the third quarter, but on more than one occasion Glencoe fought back, using rebounding and timely three-point shooting to get within two, and ultimately one point with 1:45 left in the game. But despite their effort, the Tide couldn't get over the hump and watched as the Vikings salted away the game, making six of eight free throws to seal the deal. "We were able to weather a couple of their runs," Lumpkin said. "They're a seasoned team with a lot of juniors and seniors who are used to playing in the Metro League against really good teams, so they understand how to compete and they didn't go down easy." Glencoe head coach Kassi Conditt was obviously frustrated in defeat, but was encouraged by her team's late fight to put them in a position to win. "We made a good comeback and got some big shots from Morgan DeBord and got close," she said. "But we just couldn't get over the hump." DeBord was big for the Tide, leading the team with 19 points, including a late three-pointer that helped close a six point gap to one. Lumpkin noted his desire to keep the speedy point guard in check, but tipped his cap to the senior for breaking through and keeping her team in the game. "We did our best to keep their point guard under control," said the coach. "She's very quick and very aggressive. We talked about her as the driving force behind this team, and if we could contain her we'd have a really good chance to win. But to her credit, she came on late and hit some really big shots." Forest Grove got scoring from a number of different places, at a number of different times. Sophomore guard Amanda Rebsom tallied five of the Vikings' first seven points, fellow sophomore Kendal Thrush scored six straight points in the second quarter, and Emily Lester and Olivia Grosse combined for 18 points and 11 rebounds throughout. "That's how we like it," said Lumpkin. "We want to get scoring from as many as possible." The Vikings led by two after the first quarter and nine at the break, holding the Tide to just 14 first half points. Lumpkin said their objective was to pack the paint and make Glencoe an outside shooting team, and from their zone, get a hand in the face of their shooters to keep them honest from beyond the arc. "We forced them to play on the perimeter," the coach said. "We didn't want to allow them to drive to the basket, and I think they had a hard time managing the 1-3-1, and then we just wanted to get our hands up on three point shots because all their girls can shoot." Conditt said they were prepared for what they saw, but in real-time simply took too long to adapt to it in-game. "We waited until like five minutes left in the third quarter to start playing and getting adjusted to the way they play defense," said Conditt. "We went over it in practice, but game speed is a little different." 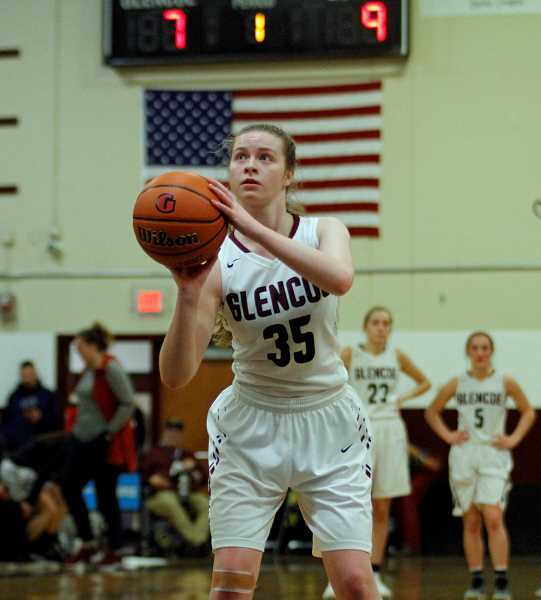 Trailing by 11 near the end of the third quarter, Glencoe responded, scoring eight straight points, including back-to-back threes by Maggie Gerber and Elizabeth Anderson to pull within 34-31. Forest Grove rebuilt a seven point lead midway through the final stanza, but the Tide again responded, this time with consecutive three-pointers by DeBord and Mallory Confer to get within one. The Vikings however wouldn't wilt under the late game pressure, getting free throws from Lester, Kayleen Dominguez and Ashlynn Dawson to ensure the league-opening victory. Something Lumpkin doesn't take for granted. "We're excited," he said. "Every league win is big, especially on the road." In addition to DeBord, Glencoe got six points and six rebounds from Confer, and six points and six rebounds from junior Brianna Ball. The Vikings were led by Rebsom who tallied 12 points and five rebounds, Lester with nine points and seven rebounds, and Grosse who scored nine. Forest Grove next hosts Sherwood, Friday, Jan. 11, at 7:15 p.m. at Forest Grove High School. Glencoe hosts Liberty, Jan. 11 as well, at 7:15 p.m. at Glencoe High School.